Searching conversion vans for sale in 2017 may result in the realization that the traditional conversion van has evolved. No longer fodder for comparison to the likes of “Scooby Doo” or “The A-Team,” today’s offerings represent refocus and refinement, marrying the demands of growing passenger loads with the type of utilitarian uses that may be more closely associated with cargo vans. Wheelchair conversion, and the customization of vans for the transportation of individuals with special needs. Concierge services, which are designed around bringing their business to their clients, rather than relying on faltering brick-and-mortar storefronts. Even millennial home-buying trends apply, with a growing number of people considering “tiny homes” and camper van conversions as a more favorable investment. Your needs are unique; as is your motivation for seeking our conversion vans for sale. Perhaps they are traditional and attuned to your business; whether they are or not, DePaula Chevrolet is committed to helping you find the one right for you. Why not start with the Chevy Express? Available in three body styles, each version of the Express is suitable for traditional uses, yet adaptable for unique customization. The front-wheel drive City Express is the most accessible price-wise, with an MSRP starting at $22,405. Showing a sleek and stylized body design, the compact “City” offers a refreshed take on the conversion van. Serving up 26 mpg (Highway, 24 City) it offers greater fuel economy for anyone concerned about the cost of mileage. The interior design is equally results-driven, including a number of features that make it ideal for use as mobile office space. Included among those are the fold-flat passenger’s seat (ideal as a desk or workspace) and available BlueTooth connectivity. 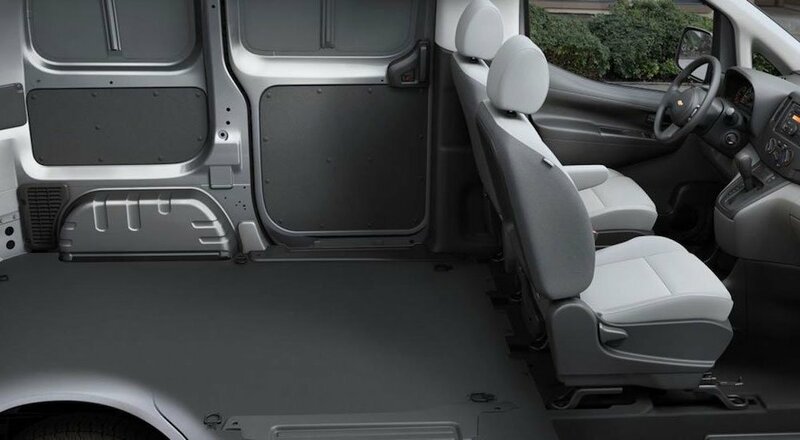 And for those utilizing rear storage space, the “City” offers 122.7 cubic feet of it, realized in the rear, measuring approx. 83”L x 48”W. Upgrading from the (basic) LS to the LT trim scores you a rear camera with park-assist, as well as 12-volt electrical outlets and power mirrors. At a starting MSRP of $30,745, the Express Cargo boasts a full-frame design able to accommodate a 4,192 LB max payload and 10,000 LB towing capacity at the max trim level. Powered by a 4.8-liter V8 engine, the “Cargo” delivers 285 hp and 295 lbs-ft of torque. Depending on the intended use, a buyer has additional powertrain options regardless of the trim level. If fuel economy is a priority, a 2.8-liter 4-cylinder option is available, while those with more demanding passenger loads might opt for the 6.0-liter V8 (delivering 342hp). The “Express” is offered as both the 2500 and 3500 load level with the latter able to accommodate nearly 1,000 additional LBS. Either way, 313.9 cubic feet will easily accommodate most every need. Finally, the Express Passenger comes in at $33,410 MSRP. With seating options to accommodate 12-15 passengers, the “Passenger” (see what they did there?) trades utilitarian suitability for humanitarian comfortability; with a 3,449 LB max payload and 9,600 LB towing capacity, it’s no slouch in terms of overall performance. Throw in the option of 4G LTE Wi-Fi and you have a near-perfect people-mover for the demands of today’s passengers. With 1500, 2500 and 3500 load levels available, there are three different powertrain options. The 1500 comes standard with a 5.3-liter V8 delivering 310 horsepower and 334 lb-ft of torque. The 2500 carries a 4.8-liter V8 standard, with the option of a 6.0-liter V8 wrangling 323 horsepower and 373 lb-ft of torque. The latter comes standard in the 3500, but there is the option of a 6.6-liter channeling 260 horsepower and 525 lb-ft. Taking into consideration its passenger-friendly design, it’s not a surprise that the Passenger boasts standard head-curtain side-impact, as well as seat-mounted thoracic air bags. StabiliTrak helps in establishing preventative safety measures, while OnStar Automatic Crash Response provides valuable reactive assurance. Ultimately, the Express is the ideal realization of the Conversion Van reimagined. Suitable for both passenger and commercial use, easily modified (and designed with that in mind), it is, in many ways, a blank slate ready to be customized to fit your specific needs. At depaula.com we invite you to visit our inventory to learn more about our inventory of Chevy Express vans. For each, you can find a comprehensive profile which includes a descriptive photo gallery and even a video introduction. Also available is a detailed breakdown of manufacturer specifications and features unique to each vehicle, ensuring that you have all the information needed to choose the right body style, load and trim level for your unique needs. We also invite you to make use of our online Shopping Tools, accessible within each vehicle profile. Our link to Kelley Blue Book allows you to check the value of your trade-in vehicle, and our payment calculator is there to help confirm which Express is right for your budget. If you require financing, we’re sure that you’ll find our online application to be a great way to take up less of your valuable time. And once you’re ready to move forward, you can even schedule a Test Drive online. At DePaula Chevrolet, we aim to create a transparent and supportive environment in which you can purchase your vehicle with confidence. Let us match you up with the perfect van for you to convert, and we are confident that we can convert your opinion of what the car buying experience can be.